Posted by Eddie & filed under Military/Aircraft, Mountains & hills, October 30 2009. On Monday I travelled to Argyll to spend the day in the hills between Strachur and Lochgoilhead. The day was mild and dry with no wind and some sunshine in the morning. I walked up Succoth Glen from Strachur, past the secretive waterfall of Eas an Fhithich and up to the rocky 658m summit of Stob na Boine Druim-fhinn. From the summit there were excellent views of Jura and Mull to the west, the summits of Arrochar to the east, a naval ship moored in Loch Goil and the tower-blocks of Greenock and the Firth of Clyde to the south-east. Proof that the best views are not always from the highest hills. Below Stob na Boine Druim-fhinn is a plantation of fir trees, and in this plantation is the site of a B-29 Superfortress bomber that crashed here in 1949. The crash was a major tragedy at the time with twenty people losing their lives. There is still a lot of wreckage left at the site today, with the main debris area in a shallow crater that contains most of the wreckage and various parts of the fuselage and wings lying scattered around the site. 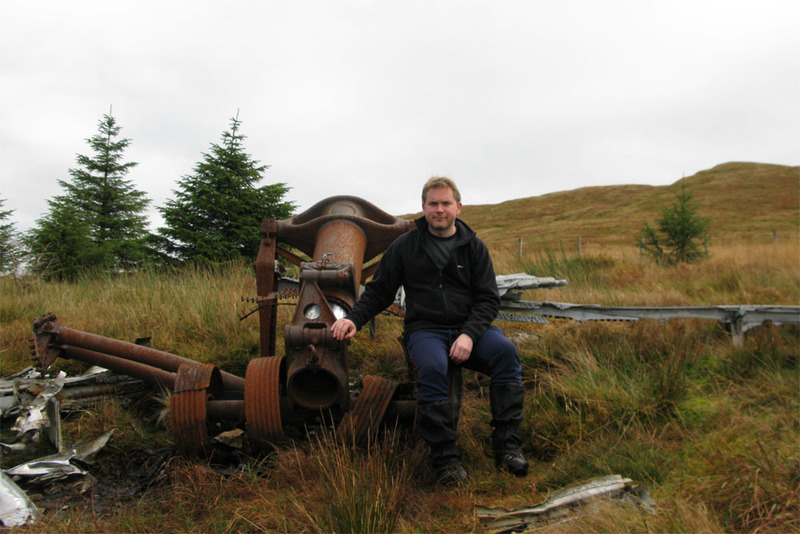 There are some large pieces of interesting wreckage at the main debris site including one complete section of the enormous undercarrage mechanism (picture above), and the tailgun housing. A memorial cairn stands at the main site with some messages from relatives of those who died in the crash. You can see the photos I took of the wreck site on my website here. how do you manage to get somany days of work!! !